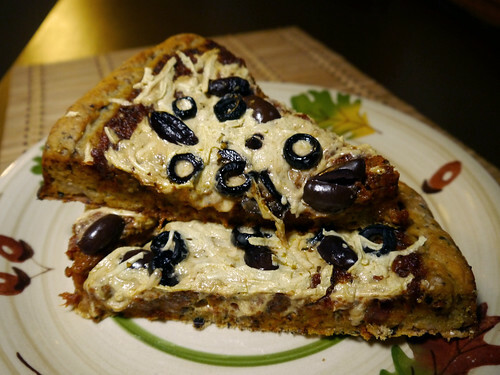 Right about the time Shane was craving a Kalamata olive crust pizza, I was contemplating the Olive Croutons in Donna Klein’s Vegan Italiano cookbook. Luckily, the crouton recipe proved easily adaptable – and the rest, as they say, was dinner. And a rather delicious one, at that! 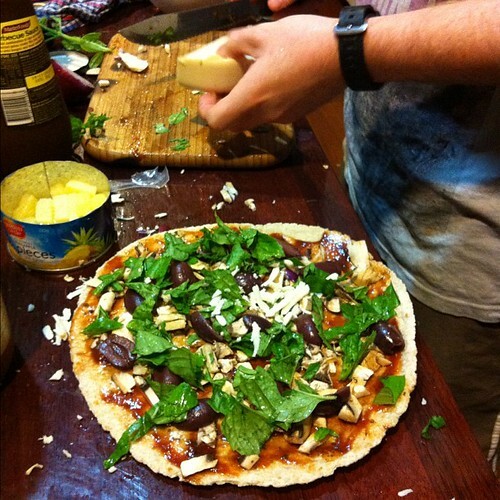 The toppings of your choice; in this case, homemade pizza sauce, mozzarella Daiya cheese, and black and Kalamata olives. 1. To prepare the dough: stir the water, sugar and yeast together until dissolved. Add the olive oil, salt, garlic powder, and Kalamata olives. Stir in the flour until blended. Form the dough into a small ball and let rest in large bowl, covered loosely with a towel, anywhere from 30 minutes to two hours. 4. 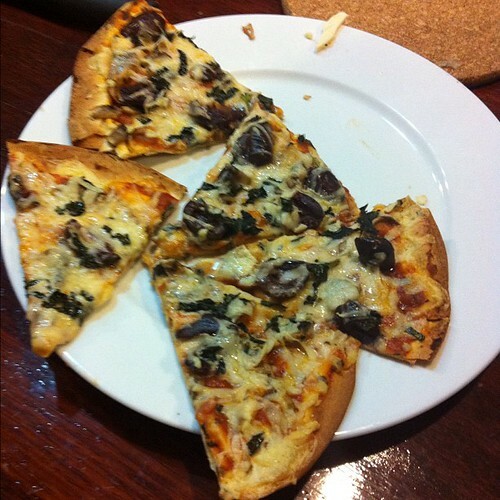 When you’re done shaping the dough, add your toppings. performing this daring feat, and no toppings were compromised in the making of this photo. Posted: 02/27/13 at 11:55 am. Filed under: Food & Recipes. Top to bottom, mom and her baby bunnies: Elleka, Mitten, and Bashul. Photos courtesy of the Missouri House Rabbit Society. This is such a sad story, y’all. When their owners no longer wanted them, they released Elleka and her companion into the wild to fend for themselves. Elleka’s friend was attacked and killed by a dog before Elleka was found and rescued by the Missouri House Rabbit Society. And, surprise surprise, it just so happens that she was pregnant! PLEASE CONSIDER GIVING THREE WONDERFUL RABBITS A FOREVER HOME. They are litter trained and friendly. Here is their story: Elleka (gray and white Dutch) and her companion were released by their owners to fend for themselves. The other bunny was killed by a neighborhood dog then a good samaritan contacted the House Rabbit Society and we took the surviving bunny. Two weeks later she had 5 babies. They are all adorable and sweet and in some way the bunny who lost his life will be remembered through these baby bunnies he fathered. Two of the babies are staying with mama. Elleka, Mitten (boy with white foot), and Bashful (girl all black) will be adopted as a trio. Posted: 02/22/13 at 11:21 am. Filed under: Find-a-Friend Friday. Notzarella! I just like saying that. NOTZARELLA! Rolls off the tongue. 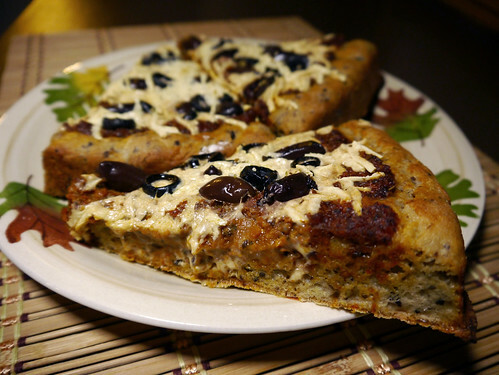 reblogged from anotherfatvegan: x recipe x <—- this blog is really cool. Posted: 02/16/13 at 1:33 pm. Filed under: Saturday Garbage Plate.